This picture was left out of the last issue. 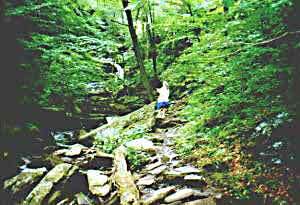 It’s one of the waterfalls in Rickett’s Glen in Pennsylvania. The trail goes past 22 falls like this one. Some are over 90 ft tall. In the last episode we were headed to Vermont. 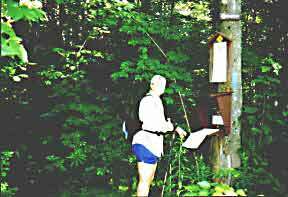 Well we made it on July 29 and stayed Mill Brooke Campground about 5 miles south of Canada. Judy signing in at the Long Trail register at the northern end. From here it’s 1.3 miles to the Canadian border, then you turn south. It rained that day and in crossing a rock face Judy slipped and twisted her knee. She made it out to the car (soaking wet) but it was too sore to continue. We decided to play tourist for a few days to let it heal. We moved south to St. Johnsbury, Vt. Home of Fairbanks scales. The arrow points to our campsite. 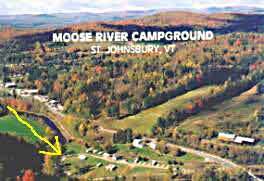 Left is our campsite along the Moose River. Right is one of the several moose at the campground. 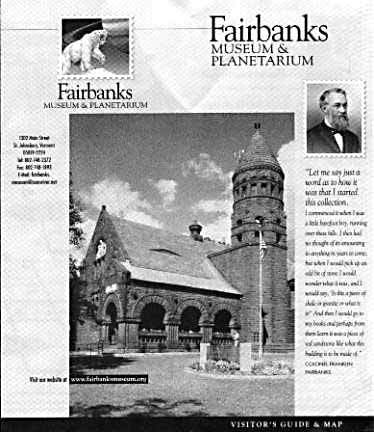 One of the Fairbanks family had such a large collection of “stuff” that he made a museum. 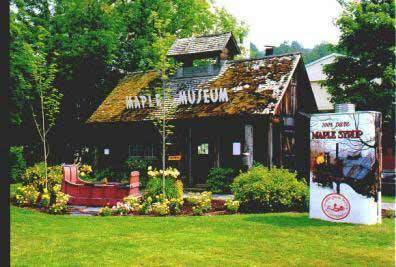 It contains one of the largest collections of stuffed animals in the East. It even has a series of pictures made of bugs. 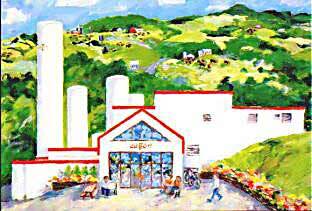 St. Johnsbury also has a large maple syrup processing plant with tours. We now know what ‘curds and whey’ are. 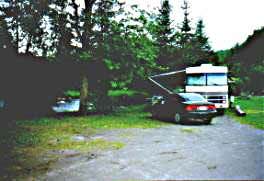 Before we left St. Johnsbury we noticed that the front tires on the motor home were wearing and made an appointment to have the tires balanced and rotated. While there the tire people said the wear was because the front-end alignment was off. 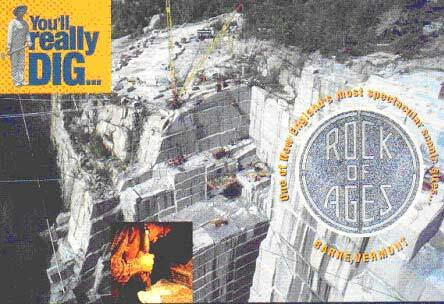 So after $100.00 we were on the road again to Barre, VT.
Barre is home to the world’s largest granite quarry. (650’ deep and 50 acres.) We took their tour but not any samples. Because of the availability of the granite the Hope Cemetery in Barre is a tourist attraction. The tombstones there are numerous, large and unusual. Among them is a racecar, a bi-plane, a volleyball, several with semi’s, and one couple has a large bed with them in it holding hands. Rock of Ages has made a full size replica of a Mercedes limo for a Chinese businessman in New Jersey. 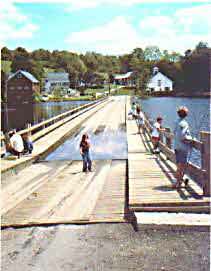 Near Barre is the floating bridge at Brookfield, VT. It was originally built in the 1800’s and has been rebuilt by the state. The day we were there it was closed for repairs. Upon reaching Interstate 87 in New York, after 30-40 miles we noticed a lot of bouncing which we thought was the bumpy road. A few minutes later the left inside rear tire blew. A call to Good Sam Road Service and 1 hour later, a service truck arrived to change the tire. It was then on to the nearest tire dealer for a replacement. Two hours and $175.00 later we found a local campground to stay the night. This campground turned out to be the worst of our trip. Their ‘pull-thru site’ was an electric post in the middle of a field. No tables and tall grass that was freshly cut and not raked. Only 15-amp electric so we couldn’t run the air. During the night the voltage became so low we thought the fan we had running would stop. The showers looked like they were built in 1950 and hadn’t been cleaned since. Needless to say we were glad to be on the road in the morning. While on I-90 the next morning we developed a bounce again. This time we stopped at the next exit and found the nearest tire dealer. They sent us to Utica, NY (approx. 40 miles). Four hours later we found that the right inside rear tire was separated and about to blow. Another new tire ($140.00) later we were back on the road. Both tire dealers said they have no idea what caused the problem and that rotating the tires should not have caused it. Both bad tires were the worn front tires that had been moved to the back. Next time that front tires get worn we’ll just replace them. 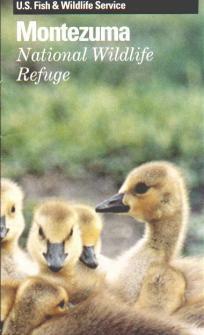 Close-by is the Montezuma Refuge. The area was drained when they built the Erie Canal but has now been restored to its original wetlands. They have a wildlife drive where we saw a red fox. Judy also drank sewer water. She doesn’t know any better. We also visited Seneca Falls, NY. This is the home of the site of the first women’s rights convention in 1848. It’s also on the canal that connects Seneca Lake to the Erie Canal. Guess which was Judy’s favorite and which was Bob’s. Judy bought a book and videotape. Can you guess what was the subject? 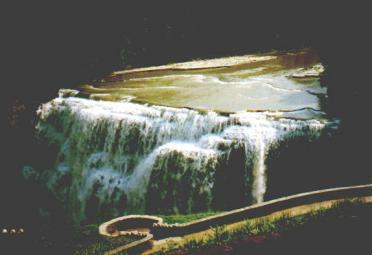 Letchworth State Park was our next stop. 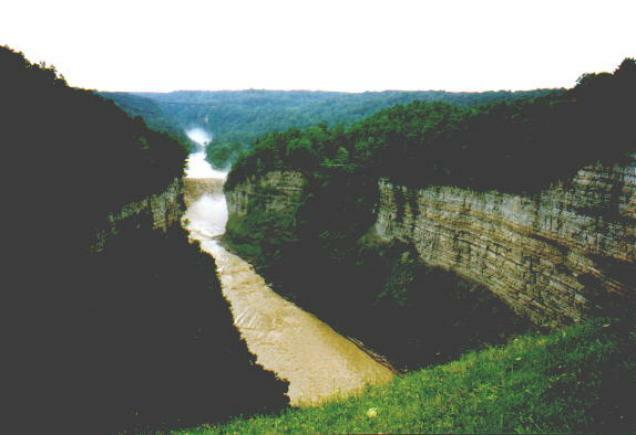 Letchworth was a guy who viewed this canyon from the train bridge back in mid-1800 and decided to buy it. The area had been clear-cut by loggers and he bought 1000 acres to restore. In 1907 he gave it to the state. The CCC’s came in the 1930’s and built additional walkways and roads. Today there are over 14,000 acres. There are 3 major waterfalls. 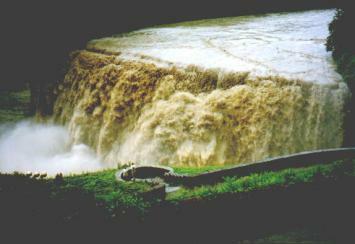 This is the middle falls after a heavy rain. This picture was taken from a walkway outside his house, which has been converted into an inn and restaurant. Note the people standing in the circular over look. This falls is over 10 stories tall!!!! This is the same falls three days later. The water level had dropped 4 feet. 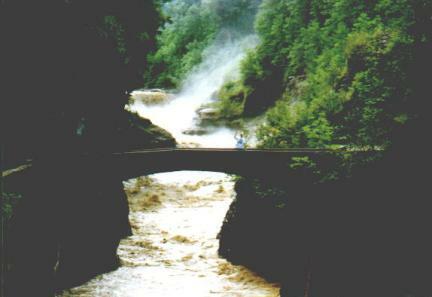 This is a view looking upstream toward the middle falls. 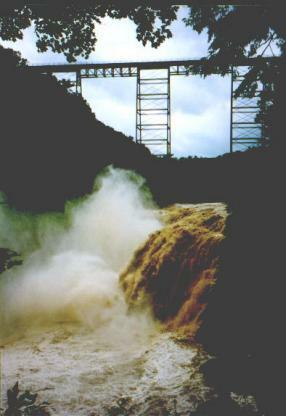 The upper falls and the railroad bridge are visible further up. The rocks on the right are over 600’ high. Yes, the edge of the grass in front of us is the top of the cliff. That’s Judy on the bridge below the lower falls. In 1972, rains from Hurricane Agnes caused a flood where the water was about 20 over this bridge. This dam is at the lower end of the valley approx. 14 miles down stream. This picture was taken in 1972 when the water was at its highest level. The valley is normally empty with only a small stream at the bottom. There are gates at the bottom of the dam to let the water through. 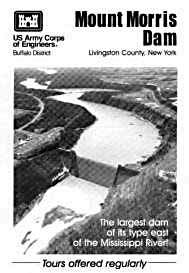 The flood was within 5’ of going over the dam. That’s 300’ deep behind the dam. That’s all till next issue.